GET YOUR GOAT Goat curry and other Jamaican classics are exemplified in high style at Sebastopol’s Revibe. Given the diversity of the greater Bay Area's food culture, it's surprising there are so few Jamaican restaurants, because the food is so good and easy to like. Slavery, colonialism and Caribbean trade routes created one of the world's most eclectic and delicious cuisines. Jamaican food draws from Africa, China, India, Spain, Britain and the island's native population. Because of its cosmopolitan influences, Jamaican food tastes familiar, but the amalgam of ingredients and cooking techniques makes it unique. That's why Sebastopol's Revibe Cafe and Scoop Bar is a welcome addition to the North Bay. The restaurant occupies what was a Quonset on Healdsburg Avenue next to Peter Lowell's restaurant. The metal building has been incorporated into a new structure that includes a dining room, bar and outdoor patio. There's also a take-out window for excellent, made-from-scratch ice cream. Will Abrams and his Jamaican-born wife, Eki, opened the restaurant in January after a lengthy remodel. Abrams has a background in nonprofit management, but wanted to try something different and showcase Jamaican food. But he hasn't left the do-good mission of nonprofits behind. The restaurant donates a whopping 50 percent of its profits to local nonprofits. Current recipients include the Ceres Project and a teen work program at the Sebastopol Community Center. That seems like a challenging business plan, but Abrams looks at it like paying an investor. Abrams scored with chef Anthony Walters. Walters trained at New York's Culinary Institute of America, but is from Jamaica's capital city of Kingston and is steeped in the country's cuisine. In spite of the restaurant's laidback vibe and Jamaican food's humble origins, there is a level of refinement in Walters' cooking, from the delicately fried leaves of kale atop the ital stew to the complex flavors of the jerk pork and the whiff of pimento wood from the outdoor smoker. For now, there are just small plates ($8.26 each) on the menu. Entrées, breakfast and lunch will be added later. There's also a late-night menu that starts at 9pm and plans to add a menu of root tonics, traditional Jamaican beverages with purported health properties. The jerk pork is the best I've tried. Pork shoulder is smoked for hours and seasoned with a variety of spices and enlivened with fiery Scotch bonnet chili pepper. While the pepper's heat comes through, it's far from a one-note dish. The tangy, aromatic flavors of the jerk marinade add up to something special. Ital is the equivalent of kosher for Rastafarians. 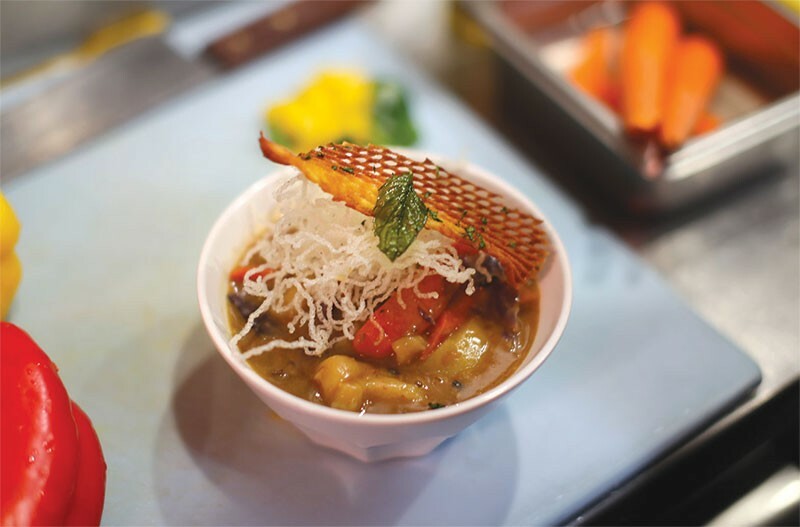 I always thought it was rather bland given the prohibition on salt, but Revibe's ital stew, a hearty, coconut milk-based stew made with propeller-shaped dumplings called spinners, is a less strict interpretation and it's great. Revibe's goat curry, made from Eki's family recipe, is outstanding, too. The curry makes it similar to Indian and Thai cuisine and it's a great choice, even if you think you don't like goat. You will, and you will like Revibe, too. Revibe Cafe and Scoop Bar, 7365 Healdsburg Ave., Sebastopol. 707.827.8188.